Background: Recorded history shows that malaria has plagued mankind for centuries, if not millennia, with the disease infecting and affecting several body tissues, organs and systems; including the central nervous system. Cerebral malaria is a severe form of malaria that may be associated with acute and chronic general behavioural, neurological or neuropsychiatric manifestations. The observation that the use of certain antimalaria drugs may also be associated with behavioural, neurochemical and structural brain changes complicates the picture, as both the infection and its treatment may cause significant changes in brain structure/function and behaviour. 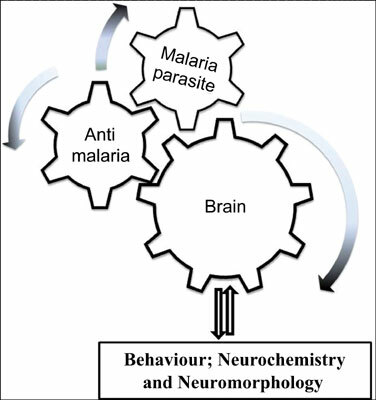 However, scientific literature appears to have made only a limited (if any) attempt at distinguishing the central nervous system effects of malaria infection from those of antimalaria drugs, and those that may occur due to possible interactions between the parasite and the drugs; as it relates to behaviour, brain neurochemistry, and neuromorphology. In this narrative review, we examine available literature dealing with the subject of the central effects of: The plasmodium parasite, antimalaria drugs, and interactions between drugs and the parasite; with a view to delineating the behavioural, neurochemical and neuromorphological changes that may occur due the infection, the drugs, and with the interactions of the drugs with the parasites inside the host. Conclusion: While research examining this subject matter continues to advance our understanding of the interactions amongst parasite/drug and the brain; for now, there are more questions than answers in relation to the effects of antimalaria drug/parasite interactions on the brain. Cerebral malaria, inflammation, malaria, memory, neurology, plasmodium species.